There is a great restaurant chain in Oregon called Cafe Yumm! If have the opportunity to visit my lovely home state, definitely check it out. I don’t want to take away from their business in any way by posting a knock-off recipe, but I can’t live without the sauce and I’m 2,500 miles away! You can find copycat recipes all over online, but none of them has been quite right (and a couple are downright WRONG), so I’ve made some tweaks that I think get it pretty close to what I remember of the original. Even if it’s not exact, it’s still dang good—for a rice/bean/veggie bowl, on a salad, as a veggie dip, whatever. This recipe makes a lot of sauce. I find it easier to just whir up a big batch and either share with friends or freeze half of it. I know some people shun soy altogether. I try to avoid it, but for this recipe, it’s such a small amount per serving that I’m willing to include it. Also, it’s highly critical that you use nutritional yeast, not brewer’s yeast, which is what some of the ripoff recipes online list. They are two very different things. It must be nutritional yeast (which I promise will find its way into other areas of your cooking, like on popcorn). Okay, enough nagging. Let’s get Yumm-ing! 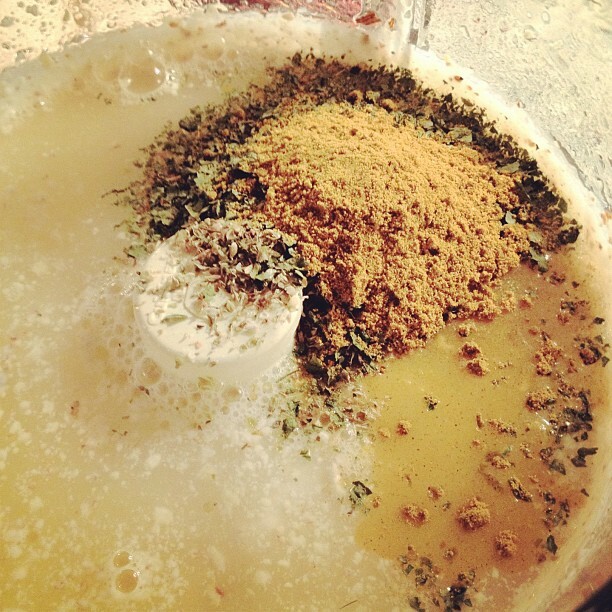 In a food processor or blender, blend almonds, beans, tofu, and oil until smooth. In my new Vitamix (wheeee! ), the sauce comes out much smoother than in the food processor. Add all other ingredients, and puree until creamy smooth. Add more water and/or lemon juice until it reaches the consistency you desire. This will keep in the fridge, tightly covered, for 7-10 days. I’ve also frozen the sauce, and it has thawed fine. However, we usually end up scarfing it up before we ever have a chance to freeze it. veggies: tomato, black olives, shredded carrots, scallions, avocado, peppers, etc. Put it on a burrito. Dip your crudites in it. Dress a salad. Eat a spoonful of it in front of the open fridge door at midnight. Oh, wait. That’s just me. It’s vegan, gluten-free, and sugar-free, high in protein, and SO, so flavorful. Really, the sky’s the limit. Let me know what you think and what other ways you find to use this delicious sauce! 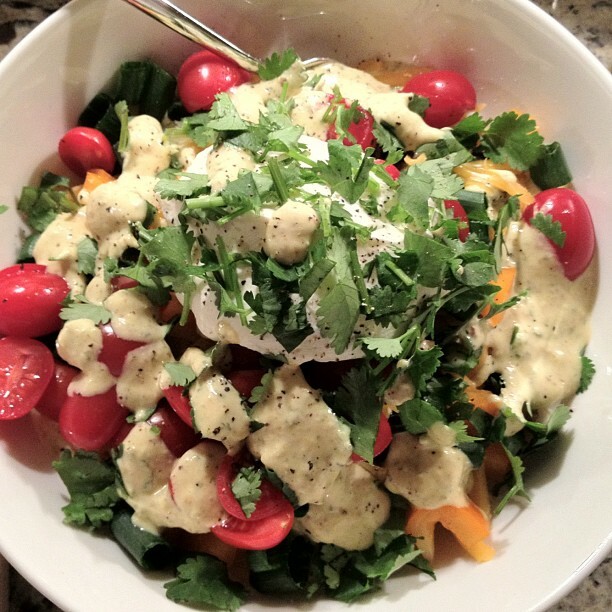 This entry was posted in gluten-free, recipes and tagged dairy-free, dip, dressing, gluten-free, nutritional yeast, sauce, vegan by Jen. Bookmark the permalink. Ooooh, so jealous about the Vitamix! This looks amazing–have never tried nutritional yeast but am intrigued. I’m feeling very spoiled by the addition of the Vitamix. Definitely try the nutritional yeast. It has a wonderful cheesy flavor. I think you’ll find lots of uses for it. Glad you did the work for me. I have been thinking about creating my own yummish sauce and haven’t gotten around to it. I show up at Cafe Yumm every month or so to buy a big bottle and bring it home. This might save me some $$ and gas. Thanks so much!! I’ve considered buying a case of it and having it shipped, but the shipping charges are as much as the sauce itself! I just can’t justify that. Let me know what you think once you’ve made a batch. I’m always tweaking it a little. My original recipe called for canned cooked soybeans (NOT edamame) in place of the silken tofu, but I can’t find them here. It changes the flavor slightly, but I still love it. And the famous Yum Sauce finally makes its appearance! I’m going to try this out THIS very weekend and let you know how it turns out. I am way too excited about this. Hey, Lover of Salsa. Have I got some salsa recipes for you. Seriously. We should have a cooking and eating day at my house. 🙂 I’m excited that you’re gonna try the Yumm sauce this weekend. I hope you love it! I. Cannot. Stop. Eating. This. Sauce. Last night, I had it on a bed of quinoa, greens, chicken, tomatoes, avocado, red bell pepper, scallions, cilantro. To die for. Today, I CANNOT stop eating it with carrots and grape tomatoes. There is just something about this sauce…it goes with the aromatic, gingery profile in carrots and completely complements the acid in the tomatoes. I am keeping it forever and ever. Well, for Pete’s sake. It sounds like it worked out okay after all, even if it initially scared Mike. I’m so glad to have another Yumm fan in the office! I bought that TruRoots sprouted rice/quinoa blend at Costco today and remembered you had mentioned something like that in your post and had to check to see if it’s one and the same – yep. Can’t wait to try it–Matthew said he wanted it for dinner tonight but I ended up doing something else. Will do soon and let you know how we like it. That’s the stuff! I got my big ol’ bag at Costco too. I think you guys will really like it. Just made my first batch of yumm sauce thanks to you! it felt like MAGIC! Thank you! Hooray! I’m so glad it worked for you. I miss my home dearly, and I miss the Yumm Sauce just about as much. At least we’ve found a solution for one of those longings. 🙂 Enjoy! Fantastic! I made this for my GF/CF hubby, who tried the original in Eugene, Oregon, and raved about it after coming home. (He added 1/4 t. pepper.) Anyway, the whole family loved it. I think it’s going on our weekly rotation. Thank you! Wonderful! I’m so glad it was a hit with your family! Delicious! Thanks for the recipe. I’ve made this a few times, but I have adjusted it because I wasn’t using the extra chickpeas. This last time, I left out the tofu and added the whole can of garbanzo beans, then a whole lemon and more water. It turned out really good and I can eliminate the soy! Just thought I’d share even though your original recipe is awesome! So this is almost perfect! satisfied the craving. My only question is what kind of curry powder. i had muchi yellow and mccormick green on hand and i chose the yellow. Wonder what kind of curry Cafe Yumm uses? Thanks for the great recipe and pics. Hi, Kate! I use a standard curry powder like this one: http://www.amazon.com/Simply-Organic-Powder-Certified-3-Ounce/dp/B00269PM6K/ref=sr_1_1?ie=UTF8&qid=1395772977&sr=8-1&keywords=curry+powder. Happy Yumming! Thanks for sharing. I’m in New Zealand and unfortunately haven’t been able to find nutritional yeast, so brewers yeast it was and I think it’s pretty good. I have friends visiting from the states in a few months and will try and get some nutritional yeast from them.